To understand how our waterways are responding to human impacts, either positive or negative, we must first monitor their baseline condition. With support from the William Penn Foundation, the Delaware River Basin Commission (DRBC), the regional regulatory agency responsible for managing the Delaware River system, recently completed a study to assess the current baseline levels of naturally occurring radiation in water samples taken along the Delaware River main-stem stretching from the Delaware Water Gap National Recreation Area to the town of Hancock, NY. Naturally occurring radiation is of particular interest due to the sensitivity of this radiochemical indicator to human-caused contamination from sources that could include the wastewater from the hydraulic fracturing, a.k.a., “fracking,” process; a process that would be extensively used to develop the shale gas fields of the upper basin in the absence of the current moratorium (see Foundation-supported research conducted by The Nature Conservancy and CNA Institute for Public Research for more detailed estimates of the potential footprint from shale gas development). The DRBC’s scientists collected 163 samples from 32 locations over a range of high and low flow conditions, using state certified protocol to analyze for radiation in several forms; the gross emission of alpha and beta particles (products of all radioactive decay), and the radioactive isotopes of Radium Ra-226 and Ra-228. Regardless of flow condition or location, the scientists found normal levels of background radiation in all samples; levels indistinguishable from what was found in clean lab water that had been rinsed over equipment. 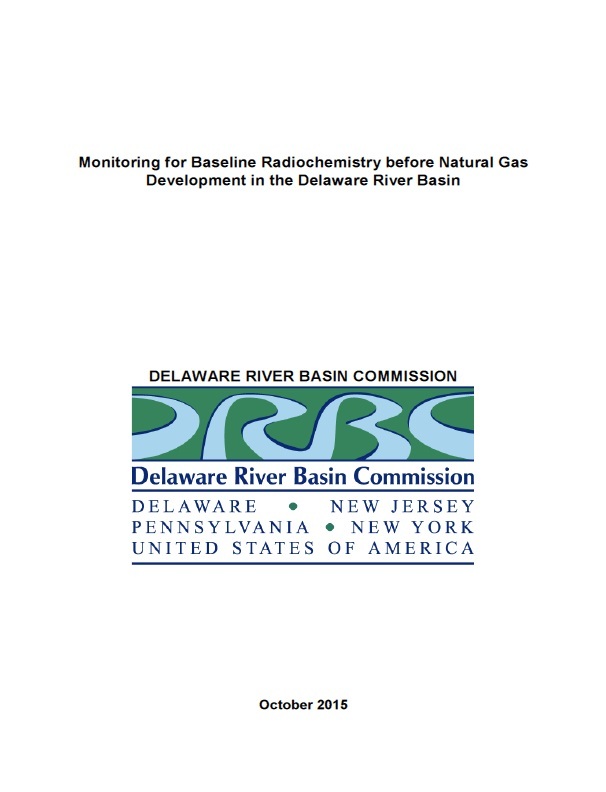 The highest levels of radiation detected were associated with Calkins Creek, where a value of 2.55 picocuries per liter (pCi/L) for combined Ra-226 and Ra-228 was detected within the creek and a gross beta value of 5.32 pCi/L was detected along the Delaware main-stem near where the waters of Calkins creek join. While high relative to the other samples, these values are well within natural ranges and well below the Environmental Protection Agencies standards for drinking water, as well as DRBC’s own standards for the special protection waters of the upper Delaware River, where alpha particles are not to exceed 3 pCi/L and beta particles are not to exceed 1000 pCi/L. With low baseline levels of radiation established for the upper Delaware, any future contamination or pollution associated with the development of Marcellus shale gas should be readily detectable. A single shale gas well can require upwards of 4.5 million gallons of water over a two to five day period (equivalent to between 0.9 and 2.25 million gallons a day) for shale gas extraction via fracking. A survey of radiation levels found in wastewater, a.k.a., flowback water, from fracking in the Marcellus region compiled by the U.S. Geological Survey (USGS) found a median value of combined Ra-226 and Ra-228 of 2,460 pCi/L, with levels up to 18,000 pCi/L detected. These higher levels are a result of the fracking process itself, which concentrates the already high levels of radiation naturally found within the Marcellus shale formation. Taking Equinunk Creek as a typical Delaware River tributary located in the Marcellus shale region, we can estimate the sensitivity of these radiochemical indicators to a hypothetical contamination event. The DRBC study found an average 0.31 pCi/L of combined Ra-226 and Ra-228 in Equinunk Creek, and historic USGS data reveals flows that range from 2.2 to 55.4 million gallons per day (MGD), with a median value of 9.7 MGD. Using these average and median values, we can show that it would only take a spill or illegal discharge of perhaps 30 gallons a day to double baseline radioactivity levels; discharge of all the flowback water from a single well could increase radiation levels in the creek by a factor of 1,000. Yagecic, J.R., MacGillivray, A.R. Delaware River Basin Commission. West Trenton, NJ. October 2015. How Philadelphia's Greened Acre Retrofit Program is catalyzing low-cost green infrastructure retrofits on private property.